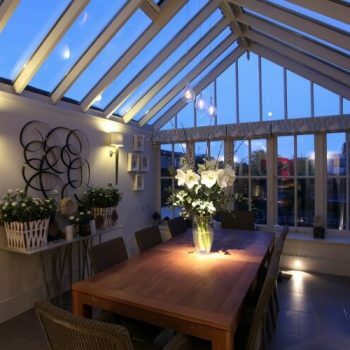 1.The first and most important solution for your conservatory lighting is to light something beyond i.e. the garden as this takes one’s eye out beyond the glass. This is really where the key investment should be made. 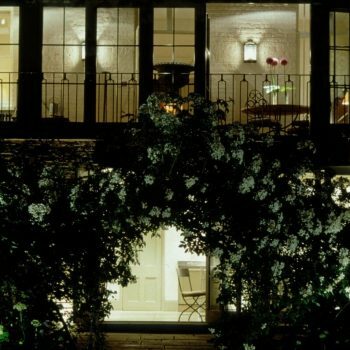 Ideally light some planting close to the glazing and then something beyond. 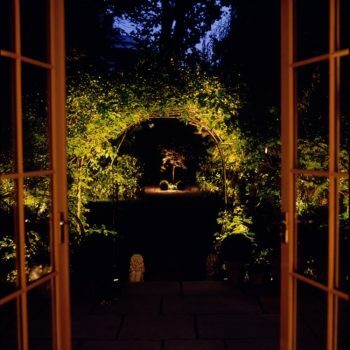 To get the most out of lighting the garden, it is important that the conservatory lighting is lit to a lower level to minimise reflections. 2.Using your conservatory as a second living room, I always consider having a 5amp circuit as this can be used for lamps or even to plug in uplights under huge planted pots. 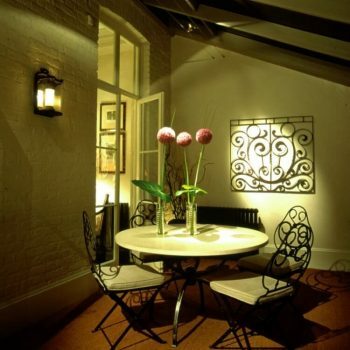 3.Consider as well concealing small spotlights like the Vorsa Port 50 Spotlight or even smaller Syon behind the structure to light artwork and potentially the centre of a coffee table or piece of art on the wall. Sometimes a wire system could be used to stretch across and provide the spotlight element. 4.For dinner parties, a fitting with a narrow beam over a dining table makes all the difference when combined with candles. 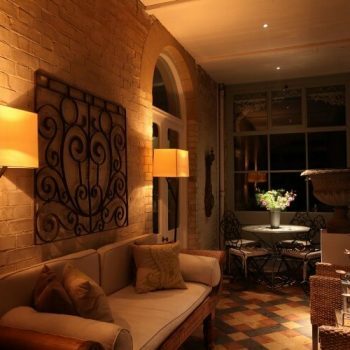 In large conservatories, hanging a decorative lantern can often provide a visual focus but this should always be dimmed to not distract from the garden beyond. 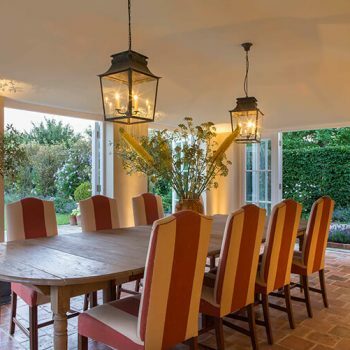 5.Combine large decorative pendants with shafts of uplight from Lucca uplights. Consider adding planting in front of them to throw them into silhouette and create interesting patterns on the ceiling. If you are not starting from scratch, simply use a plug-in Square Highlight to create the same effect. 6.A simple tip is to always put your lighting on a dimmer switch to ensure that you can change the mood to suit the occasion.